Paul speaks clearly about the subject of government in Romans 13. All should be subject to authorities, because “there is no authority except from God” (Romans 13:1). Pilate received the same answer from Christ: “You would have no authority over me at all unless it had been given you from above” (John 19:11). But what of the authorities themselves? What does Scripture have to say about them? And what implications does this have for a Christian understanding of government? First, all authority stems from God, and no authority exists apart from God. The Lord may use various means to establish that authority, whether war or elections. 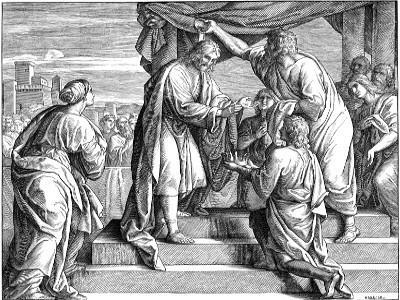 The Church chooses Stephen, for example, and this choice is ratified by the disciples (Acts 6:1-6). However, the voice of the people can certainly be contrary to the will of God. Elections may in fact be sinful (Numbers 14:1-4; 1 Samuel 8:4-9). Therefore, it is not the will of the people which constitutes authority, but the will of God for His own purposes (Isaiah 45:1-7). This is especially important in our own day, since we have a tendency to regard authority illegitimate if consent is lacking. While the Lord willed it, Israel served the king of Babylon, and that authority was legitimate, even if limited (see, for example, Jeremiah 27). A ruler is “God’s servant for your good” (Romans 13:4). This may be to reward what is good, but it is frequently also to punish what is evil. The Law of God is written on the heart of all men, even if indistinctly (Romans 2:14). It is indistinct among those who do not have the written Law, because its fulness has not been revealed to them. The giving of the Law at Sinai means that some “have the Law” while others only do what the Law requires while “not having the Law.” In either case, the ruler serves to bring the wrath of God upon malefactors. He is an instrument in the hand of God. He carries out the Law, but does not give the Law. Even in monarchies, where the king is regarded as a law-giver rather than merely an executor, such laws may not abrogate the Law of God. The ruler, too, is a man under authority. 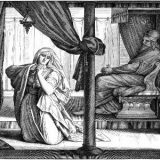 Paul uses a rather interesting word to describe this relationship between God and the ruler. In Romans 13:6, Paul says that authorities are “ministers” of God. Minister, in the English language, is somewhat vague. Paul uses the term leitourgos, from leitourgia, from which we get our word “liturgy.” A leitourgia in Greek refers to a public service of some kind. It may be the work of a citizen done at his own expense or a description of any kind of public duty. It came to be used in a religious sense, because the Greeks regarded their gods as recipients of public transactions. So long as the gods were happy, they would return the favor on behalf of the state. Christians borrowed the word in a generic sense to describe their worship, but casting off the pagan baggage that came with it. They were so effective in doing so, liturgy is used almost exclusively in a religious sense today. That being said, Paul argues that an authority is a leitourgos, one who performs a liturgy. His public duty consists in being the servant of God, the avenger of His wrath upon evil, the rewarder of what is good. What this means, then, is that the ruler sits in a subordinate position to God. He has a public burden to carry out, and therefore sits under authority. A Christian who obeys the earthly king is not dividing his loyalties, but rather serving God through such obedience. Peter stating that “we must obey God rather than men” in Acts 5:29 is a recognition that earthly rulers frequently sin. They must not be obeyed in themselves, for that would mean participating in their sin, but rather God commands us to obey earthly rulers. Christians obey God when they obey men. They do not obey men in spite of God’s command (1 Peter 2:13-17). This means, though, that it is not an idle question whether a ruler believes in God. The king who sins is sinning against God. The Scriptures are full of warnings for rulers, calling them to fear the Lord. One notable example is Psalm 2:10-11: “Now therefore, O kings, be wise; be warned, O rulers of the earth. 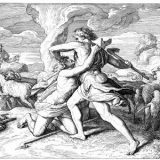 Serve the Lord with fear, and rejoice with trembling.” Nebuchadnezzar served as the instrument of God’s wrath upon His people (Jeremiah 25:8-9, for example), but Nebuchadnezzar also suffered the wrath of God for his sin and his boasting against the Lord (Jeremiah 25:12-14; Jeremiah 51:24; Isaiah 14:12-20; Daniel 4:28-33; etc). Thus, while the Lord will do as He pleases, the unbelieving king will suffer for his sin, and the nation may well suffer with him, just as Egypt suffered for Pharoah’s hardened heart (Exodus 7 ff. ).